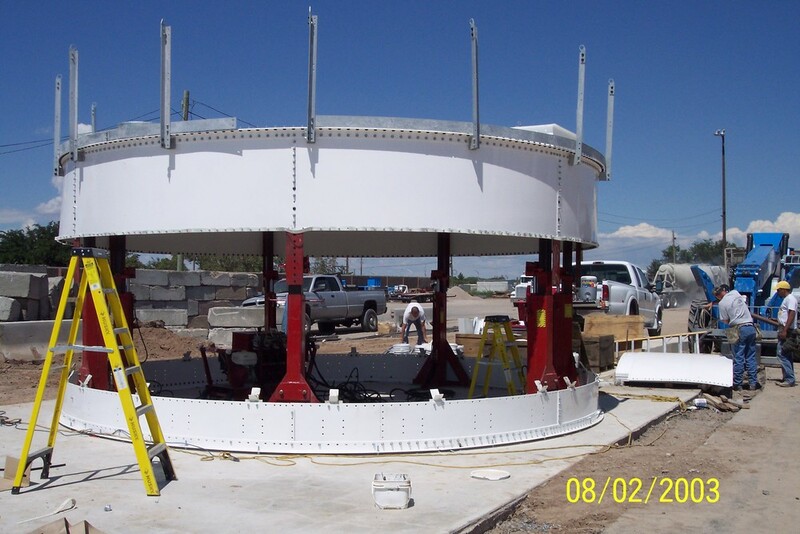 Video showing a smoothwall tank being raised with Bainter Jacks by Global Mechanical. Our hydraulic power units are available with capacities from 10 jacks to 60 jacks with powerful gas and diesel motors. All power units use our proprietary cartridge equalization system to lift your tanks and bins evenly. 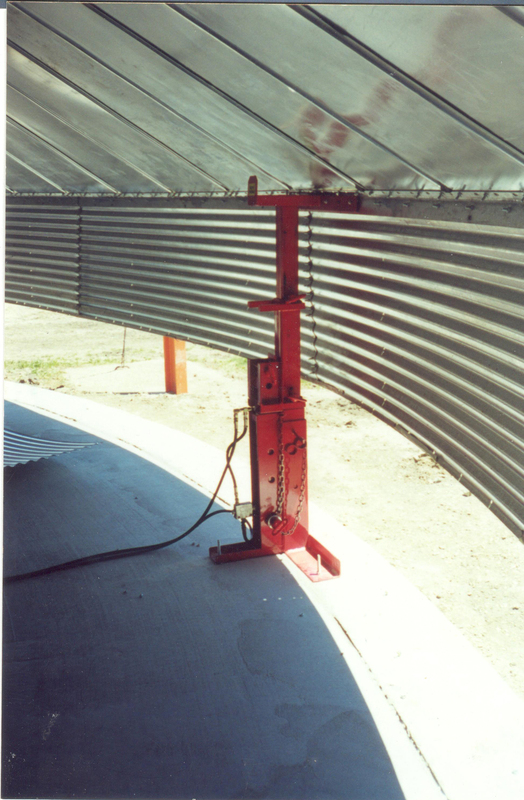 Bainter hydraulic jacks are available in seven different models to meet your needs, whether you are building grain bins with 32" to 44" corrugated panels or are building tanks with 5' to 8' smoothwall panels. Specially designed jacks are also available for lifting tower dryers. 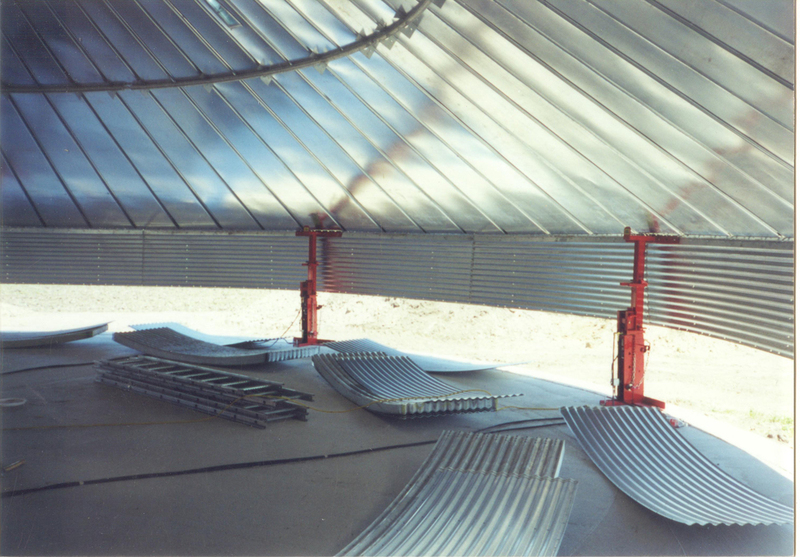 The Bainter center ring support and rolling stairway system will make building your bin roofs easier and safer. for bins 36' in diameter and up. Heavy duty center roof support towers also available. Winter Discount- 10% in November, 8% in December, and 6% in January. Note- This year all equipment is able to be discounted! Orders must be purchased and paid the month to get the monthly discount. 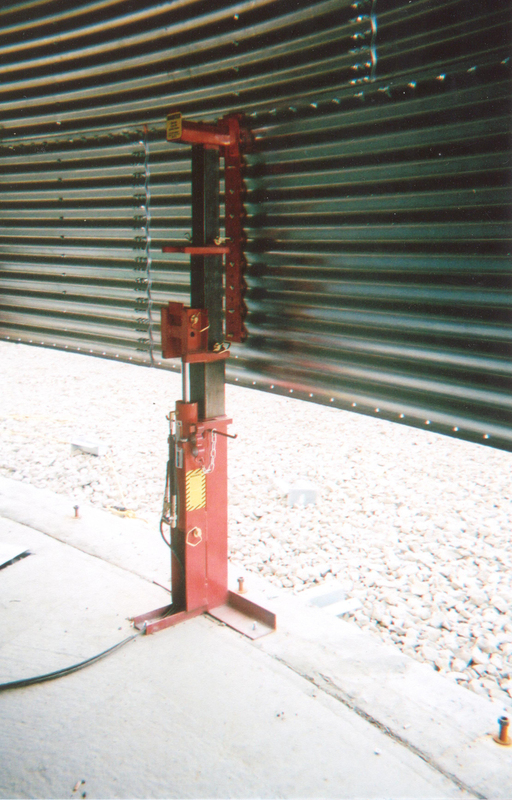 for all panels 32" to 44"
Our improved original jack model: in production for over 20 years. The Bainter standard hydraulic jacks are engineer certified to lift 7,500 lbs each with a 100% safety margin. This is our most popular model with thousands sold worldwide over the last fifteen years. 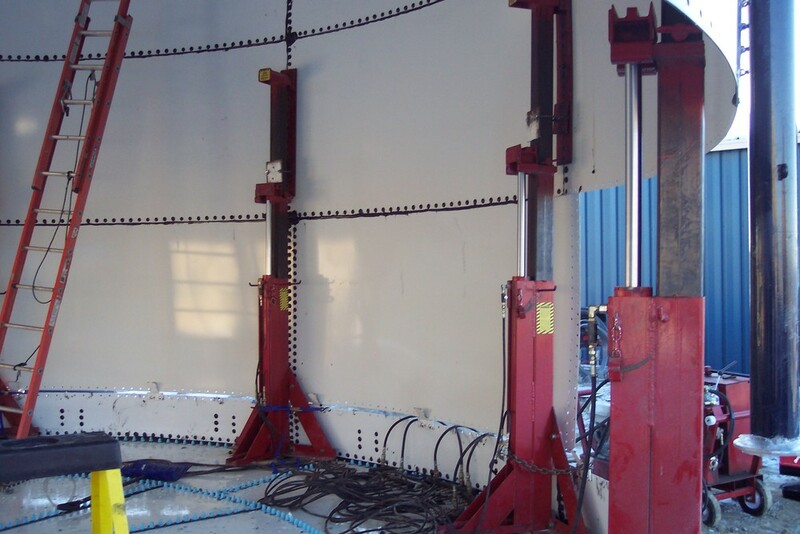 Our standard jack is a three stage jack, providing exceptionally even lifting. Every Jack includes 35’ of hydraulic hose on the inlet and outlet lines as well as all needed quick connection fittings. 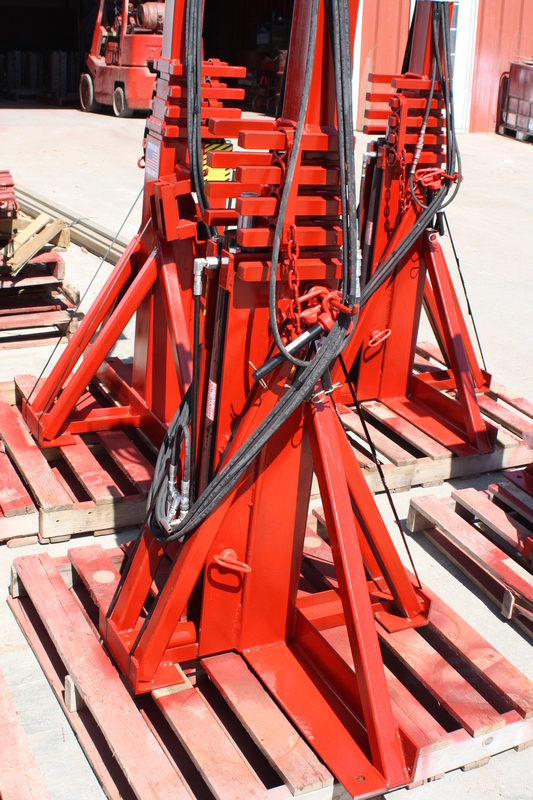 The jacks are adjustable to accommodate bin rings from 32” height to 44” height. 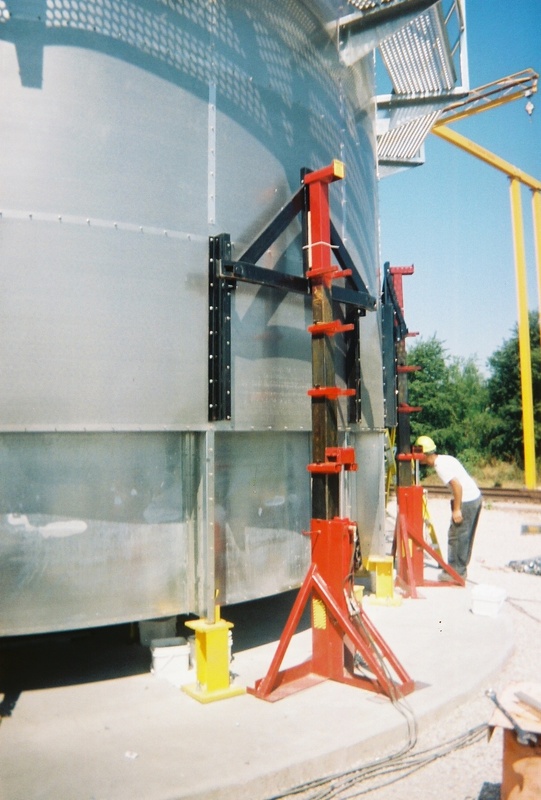 Simply by moving two pins the change in ring height can be made in minutes. T tops are standard equipment on these jacks. These Jacks have a maximum lift height of 46 inches. New jacks feature extra angle bracing, and enlarged steel tubes give version 2.0 increased stability and strength, while remaining fully interchangeable with original model units. The Bainter 9,000 Lb Capacity Smooth Wall Hydraulic Jack is high-lift jack designed for smooth wall tanks with 5’ rings. This model has an engineer certified 9,000 lb. safe lifting capacity and by the use of interchangeable brackets it is versatile enough to be used in many different applications. Brackets can be custom ordered to fit different manufacturer’s hole patterns as needed (USA Tanks, Tank Connection, Harvestor, etc). 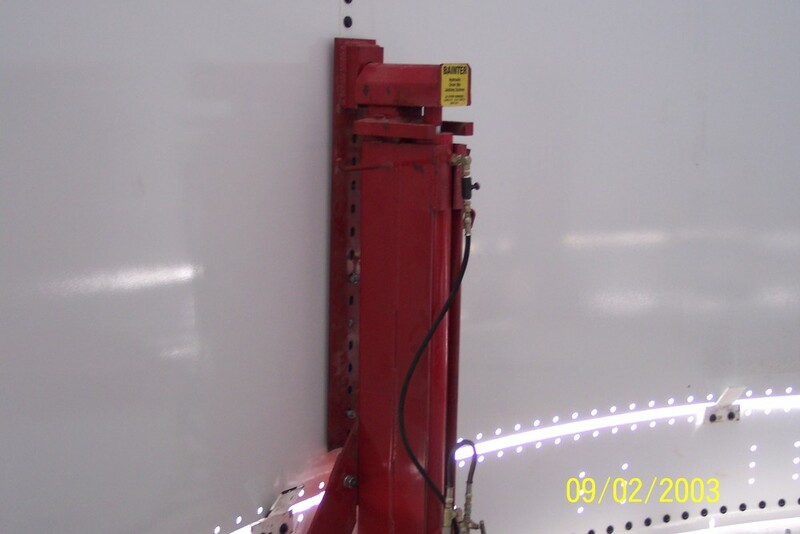 These jacks have a Maximum lift height of 70 inches. The Bainter 15,000 Lb Capacity Smooth Wall Hydraulic Jack is a newly engineer designed high-lift jack designed for smooth wall tanks with 5’ rings. This heavy-duty model uses a reinforced base and thicker steel to obtain an engineer certified 15,000 lb. safe lifting capacity. By the use of its interchangeable brackets it is versatile enough to be used in many different applications. 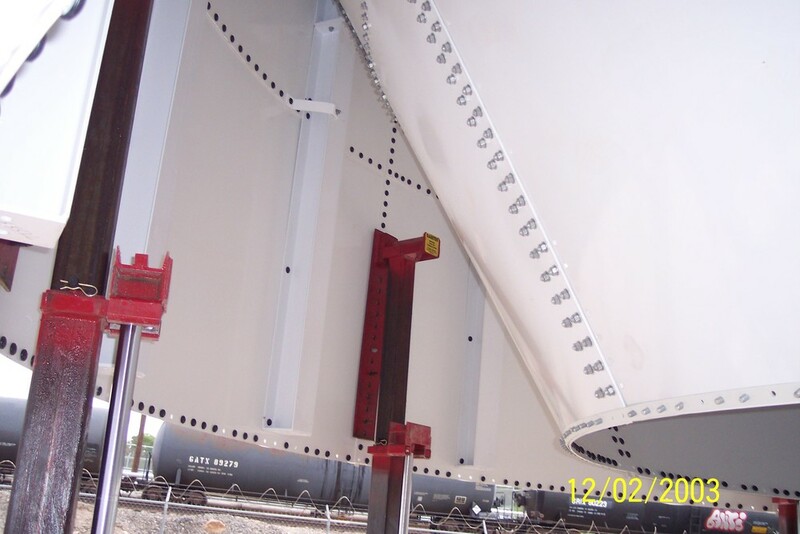 Brackets can be custom ordered to fit different manufacturer’s hole patterns as needed (Tank Connection, Harvestor, Tarsco, CST, etc). These jacks have a Maximum lift height of 70 inches. 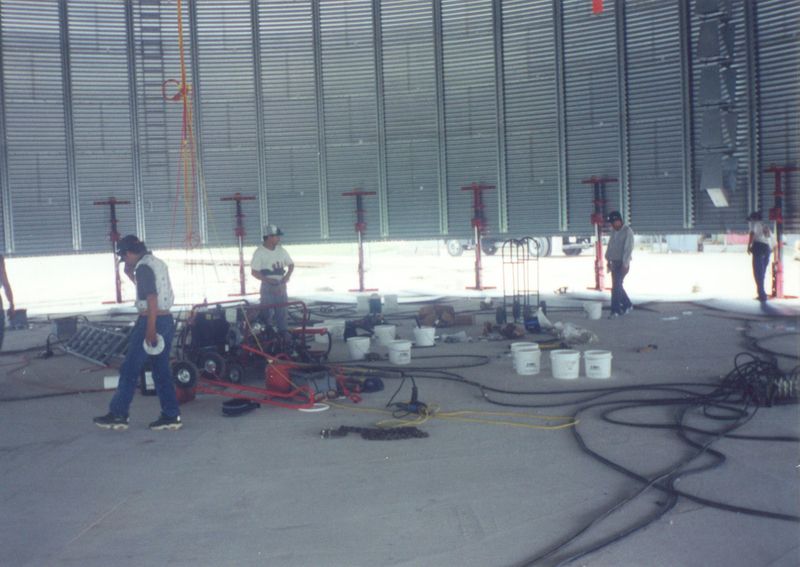 Our highest capacity equipment for your largest projects. 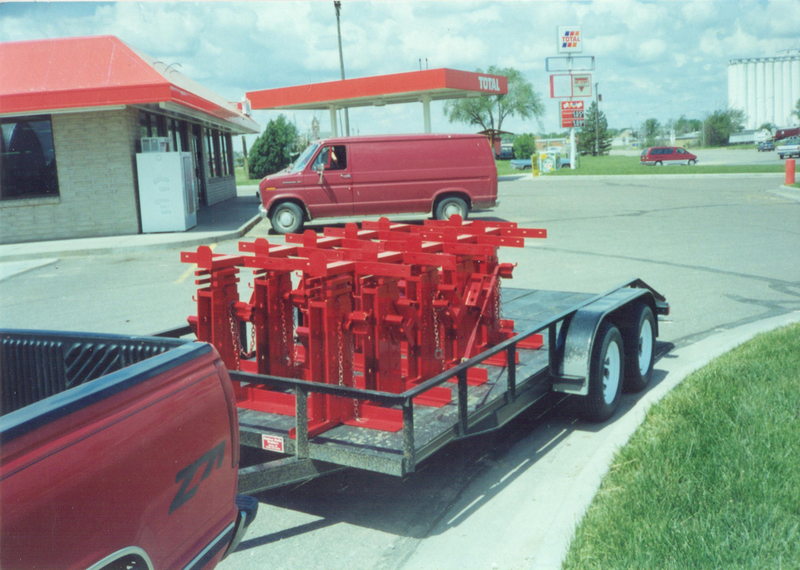 The Bainter Twin-Cylinder super commercial jack has been specifically designed for use on bins that require a higher lifting capacity than our regular commercial jacks. 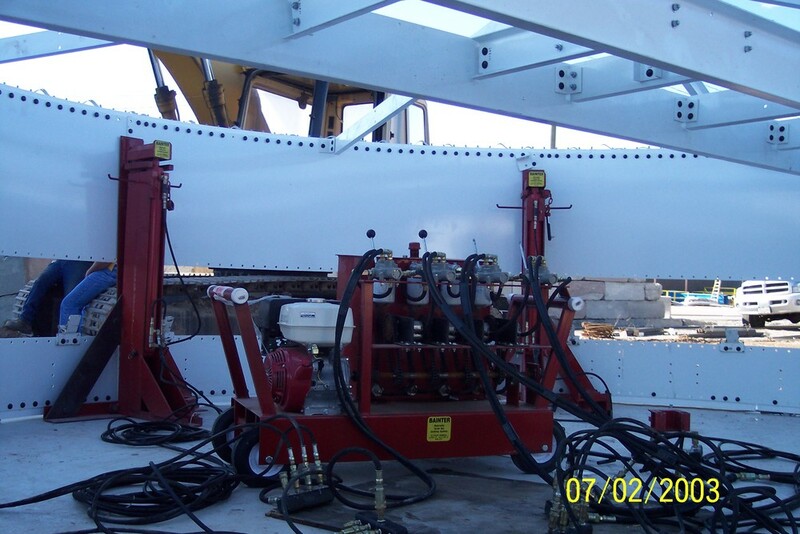 Twin-cylinder jacks are engineer certified to lift 29,000 lbs safely. These jacks will be especially useful to contractors building 135’ dia. or 155’ dia. grain bins. These jacks operate on the same principals as our other hydraulic jacks and can be powered by the same hydraulic power units. The Bainter twin mast hydraulic jack is designed to lift either 5’ or 8’ tall panels found in smooth wall and chime tanks. Works equally well for bolted and welded style tanks. This entirely new design uses a traveling shuttle and stationary twin masts to provide an extremely strong and stable jack that can lift the tall heavy tanks being built today. Each Jack has an engineer certified 15K lb safe capacity. The jacks are designed to be assembled at ground level for convenience, then pivoted upright for use. 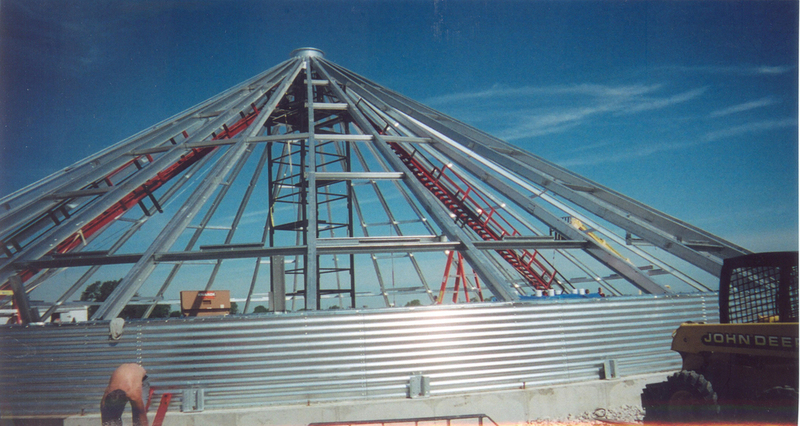 The Bainter Roof Support Tower & Rolling Stairway System greatly reduces the amount of work required to construct large grain bin roofs. A large four legged center tower with many cross braces for stability supports your center ring on arms that can be configured to hold rings with a diameter from 3 feet to 12 feet, as you need. the entire tower breaks down into small pieces for easy transport and can be assembled easily and safely with only a small number of workers. The stairway is comprised of five foot stair sections that quickly bolt together to accommodate varying bin diameters. The whole system breaks down into small parts for easy handling and hauling. The stairway rolls around a top track on the tower to what ever position is needed. two stairways can be used on one center tower to speed up your construction time. 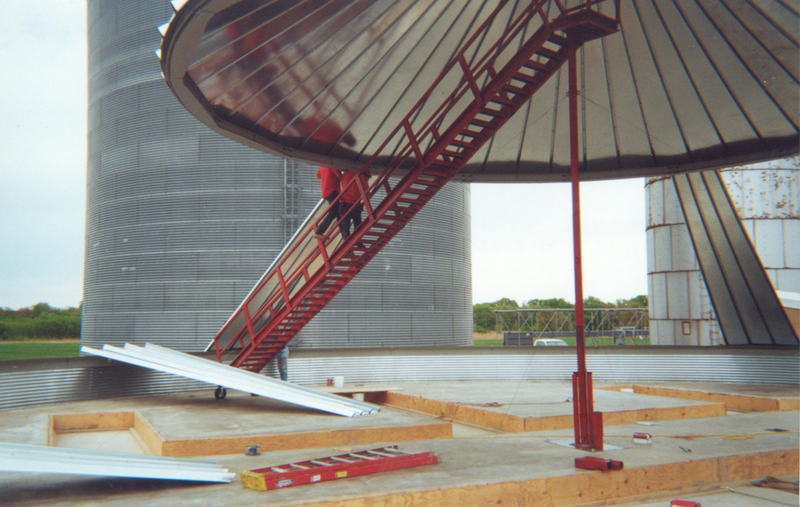 The Bainter Center Ring Support & Rolling Stairway System greatly reduces the amount of work required to construct grain bin roofs. The center pole is comprised of various lengths of connecting square tubes and enables you to position the stairway and the center ring support at the desired height. The stairway is comprised of a top landing and attached five foot stair section, and additional five foot stair sections that quickly bolt together to accommodate varying bin diameters. The whole system breaks down into small parts for easy handling and hauling. 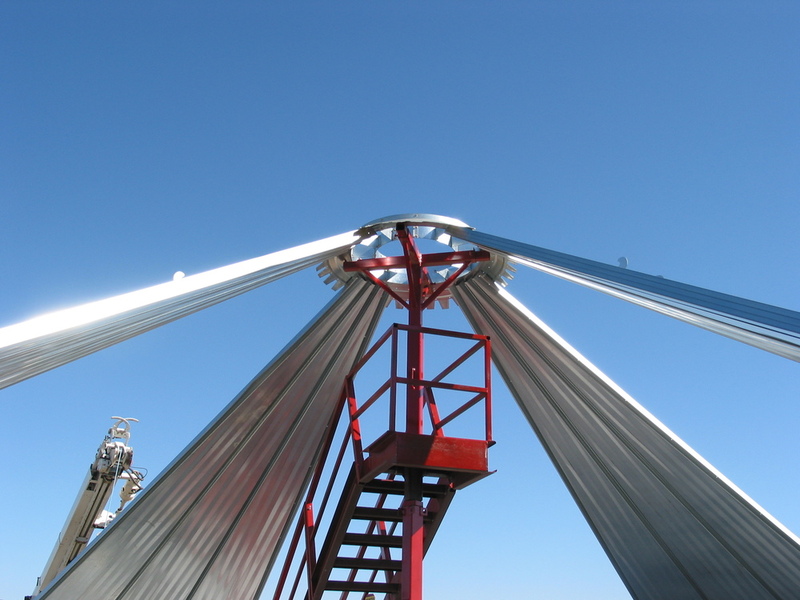 The center pole has support legs that slip into square tubes welded to the base to provide a wide foundation for the tower that is exceptionally stable. 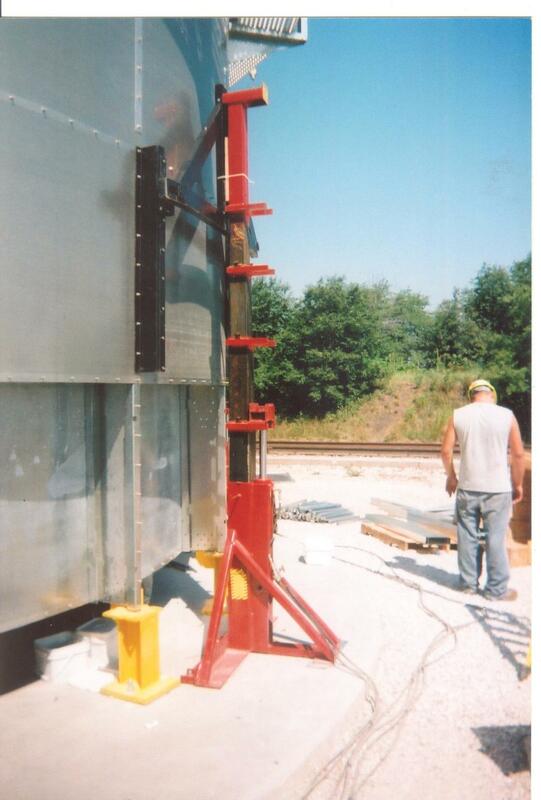 To adjust the height of the center tower there is an adapter bracket welded to the side to allow a Bainter Hydraulic Bin Jack to lift the tower. A cable winch can also be used to lift the tower manually. The center ring support bracket is adjustable to accommodate varying sizes of bin center rings. The Rolling stairway moves easily due to the large tires on the bottom and the hinged pivot point at the top. One of the greatest advantages to the center tower is its versatility. 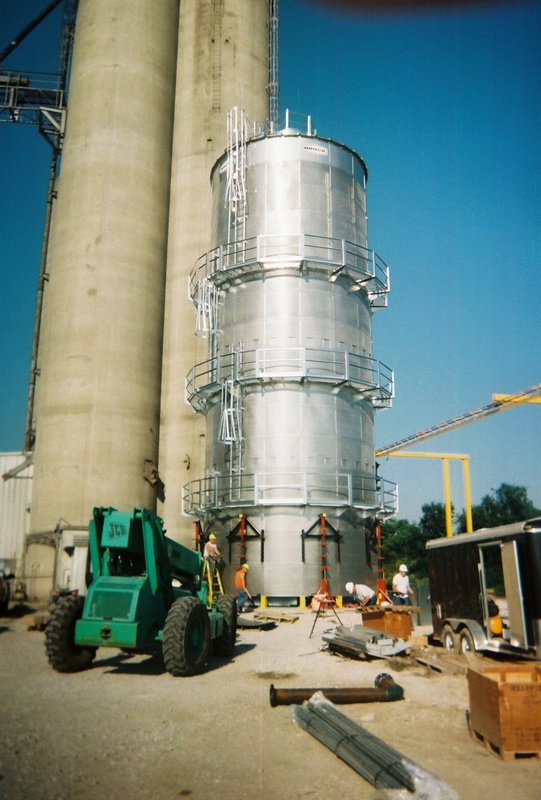 Because of its modular construction the stairway can easily be expanded or reduced in size for different bin diameters. By buying extra pieces a stairway can be expanded for larger bins. 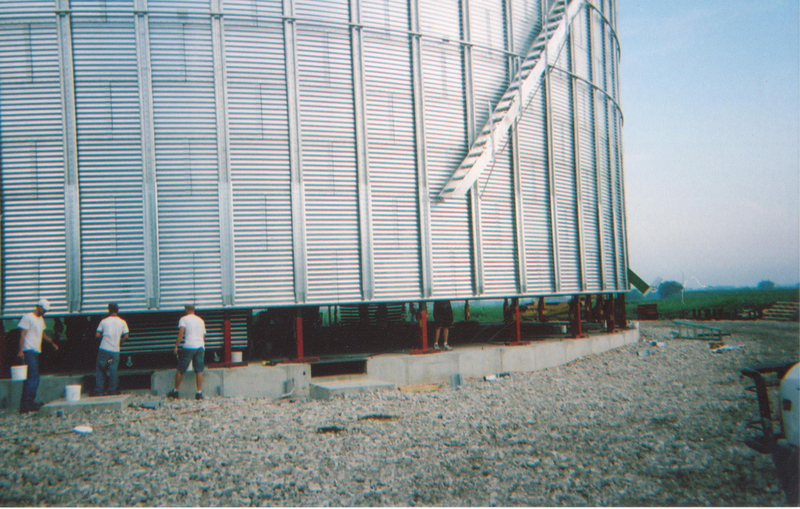 This system will work for all bins from 36’ diameters to 155’ diameters. Note: all bins large than 105’ diameter use a center roof support system with a large reinforced tower, this is also optionally available for 90’ and 105’ bins, if interested call for details. 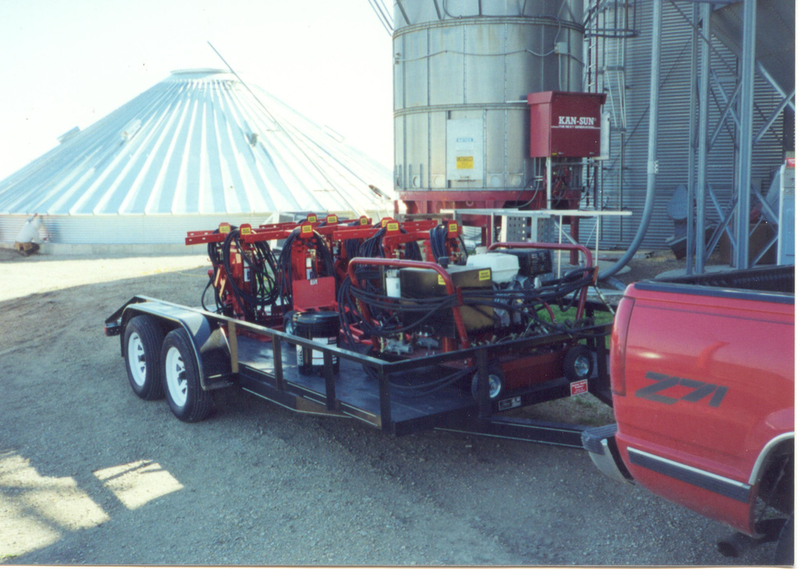 Our 10 Jack Capacity small power unit is your best choice for smaller bin jack systems. A 6.5 hp Honda motor provides plenty of power to run your jacks and will reliably operate for many years. Our proprietary flow equalization manifold allows for simple one lever lifting. One control valve moves all jacks in synchronized lifting. The power unit is completely self-contained and requires no electrical connection. The power unit is mounted on a wheeled cart for good mobility and is sized to fit through standard bin doors or under a standard bin panel sheet. This is our most popular power unit and is a great starter unit for building small farms bins. Larger power units with an all new design. Our 30 jack and 40 jack capacity power units both use the same technology as the smaller units to achieve user-friendly equal lifting for larger bins. These power units both use a 38 hp Kohler motor. The 30 outlet power unit will accomodated bins of up to 90' diamerter and the 40 outlets allows building of bins 105’ diameter and up. These power units also use the standard cartridge equipped flow equalization manifolds to allow for even lifting every time. The power units are mounted on two wheeled carts that can be separated for ease of mobility. An extra large power unit for extra large jobs. Our special diesel powered 50 or 60 jack capacity power unit is the largest pump we currently build. It will power up to 50 or 60 jacks and uses the same cartridge equalization system that has proven accurate and convenient in our smaller power units. A reliable 60 hp Cummins diesel motor provides power. If you will be building 135’ or 155’ dia. bins this is the power unit you want to get the job done. This power unit is mounted on two separate carts, one with the motor and reservoir and the other with the manifolds.